Take the game Clue and turn it into real life - Jumanji style (except no one will really get murdered). Death Of The Party makes players actually be part of the game, wearing persona name badges and moving between rooms trying to solve the mystery or commit the crime. This game takes a simple concept and adds moderate complexity with strategy and turns it into a one of a kind party gaming experience. Great for medium sized groups, everyone will have an important role to play in Death Of The Party. After all, either the murderers will win or all the partygoers will win if they correctly catch the murderers. After your first time through you'll want to try this game over and over. Check out more about Death Of The Party below and be sure to grab your copy today. Review Completed (2017-10-24) If you have ever played a board game, chances are you have played or at least heard of the game called Clue. 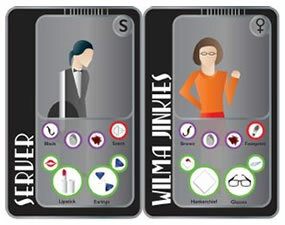 Clue uses a person, a weapon and a room to aid in the game play as players try to pinpoint who did what in which room. Now think of a game where there are multiple killers, more clues and best of all, you are actually part of the game. Death Of The Party comes to life as players become part of the game by wearing their player on a lanyard and physically moving between different rooms. Game pieces (cards, envelopes, etc.) are well illustrated with a detective theme present throughout. We were a little skeptical about moving around and thought it would be a useless filler mechanic to the game. Oh were we wrong! This adds to much to the game as you actually have to use the rooms to your advantage and commit your murders in private. We also loved that this game can handle a relatively large group of people with up to nine people playing. Getting everyone on the same page while explaining the game rules took a bit of time (about 30 minutes). Once everyone was on the same page the game begun and very few questions emerged. After the first game you could tell brain gears were turning as everyone could see how they could have played the game slightly better to their advantage. With as little as a 30 minute play time we were able to play a few rounds which gave just about everyone the chance become a murderer. The copy of Death Of The Party we received was a prototype so we’re not sure if anything will change. While all interior game pieces were well done and made with acceptable quality, the game box was slightly more flimsy than we would have liked to see. Hopefully this will be improved with production games. UPDATE: Game box was improved and looks very good and sturdy. 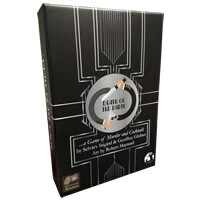 Death Of The Party is a great murder mystery that stands out from other social/board games since players are actively on their feet playing out the game. We really loved this aspect of the game. Some players struggle winning these types of game but they can still play a critical part in the game. If all murderers are caught then everyone else wins so it’s not necessarily a one person winning game. Get away with murder or correctly accuse all the murderers to win. 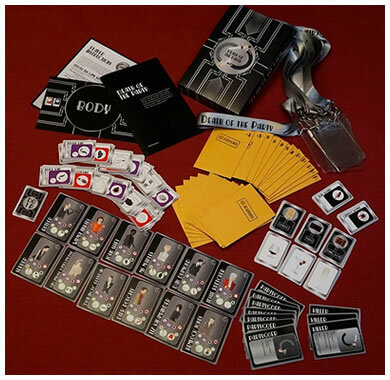 You get a body card, 9 lanyards with sleeves, 12 persona cards, 10 identity cards, 35 drawer cards, 72 clue cards, 12 identity envelopes, 27 drink cards, 22 weapon cards, 5 partygoer item cards and the official Death Of The Party game rules and instructions. Please keep in mind that the official Death Of The Party party rules and instructions could be different depending on the game version you have. The rules below are some of the exact directions on how to play Death Of The Party. Share with us your comments, funny stories, tips, advice, strategies, creative ways to play, questions about how to play, problems with the rules or anything you want about Death Of The Party. All submissions will be reviewed within 24 hours. Click here to add your Death Of The Party comments.